These days… Johnny Impact is everywhere. Known for his aerial artistry and in-ring creativity, the reigning Impact World Heavyweight champion has been seen flying the friendly skies of federations like WWE, Lucha Underground, and AAA over the years. He’s played the title character in his own movie, and became a reality TV star. But, when Johnny finally landed in Impact in 2017, he not only took on the company’s name, he took on the responsibility of being the face of a downtrodden franchise. Times were bleak then, but after an almost miraculous turnaround, The Order of the Owl has had a historic resurgence over the past year. And in the meantime, Johnny has emerged with championship gold. 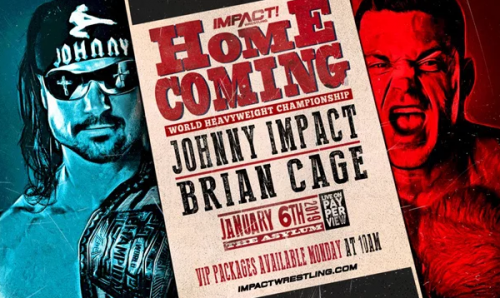 He’ll defend his title on January 6th against Brian Cage,at Homecoming, on a night that he says will carry a lot of meaning for Impact Wrestling. Though he’s worked in nearly every corner of the world, the running joke about Johnny is that everywhere he goes, he has a different surname. He’s been called everything from Nitro to Morrison to Mundo, and now bears the namesake of the promotion that he calls home. Now, he wears the ‘Impact’ moniker as not only the company’s titleholder, but also its most recognizable star. Lately, the mercurial moonsaulter has been busier than ever, appearing on Impact on Pop and making the rounds to help promote the Homecoming pay per view, He also recently appeared on the 37th season of CBS’ Survivor (He finished 12th). And, he played a very real-life role in June – as “The Groom”, when he wed fellow wrestler Taya Valkyrie, now currently the top contender for the Knockouts title. Impact says that he loves working in the same company with his wife, and that he’s been impressed with her performance since returning from injury. Another hat that Johnny currently wears is as an example to the company’s rising, young stars. For a guy who has had a lot of titles in his professional life, he’s added one more: Locker Room Leader. Johnny says he tries to keep everything balanced, from success to failure. And, he imparts that same wisdom to his youthful co-workers. He has made that journey, and beyond – capturing the ultimate prize at Bound for Glory 2018. Now, waiting for him at the Asylum will be the onslaught of a massive challenger, Brian Cage, who has looked unstoppable since joining the promotion in February. Impact says that he’s looking forward to the showdown with The Machine. One thing’s for sure. Win or lose, there will be no mistaking who Johnny Impact is when he enters the building on January 6th: A Movie & Television Star. A Husband. A Leader. And a Champion. In other words – All the Above. His name, and his company, will all enter 2019 riding a wave of momentum that they haven’t seen for nearly a decade. For his part, Johnny says he’s excited to see where it’s all headed, and believes that both he and the promotion are just getting started.